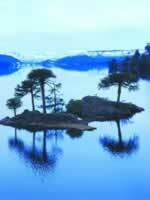 Fly-casting in Argentina is gaining new enthusiasts and horizons. In addition to the traditional and excellent fishing of salmonidae in the summer, we must also consider the catching of dorados in the littoral during the winter season. 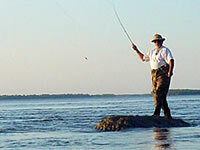 Undoubtedly, fly-fishing is the maximum expression of sport fishing. For many anglers, more than a fishing technique, it is a form of art. 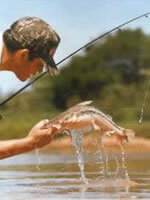 This is possible due to the elegance and the aesthetics displayed by an angler during the casting of their fly. The flies are artificial devices designed and tied by man's hands, trying to imitate insects or small fish that represent the food consumed by trout, dorado or any fish the angler wishes to catch. Among the flies, we can mention the dry flies, which work over the water surface, imitating adult insects or insects that have fallen into the water. There are also wet flies, which work under water, imitating diverse stages during the life of insects before they grow up and reach the surface. And finally, there are the streamers, which imitate small young fish which are attacked by other fish. In this modality, the presentation of the fly is essential, and it needs a correct technique, as the fish -especially the trout- know most insects and the way they fall into the water perfectly well. Our flies must "fall" of land on the water in the most natural and delicate way possible, so that the fish do not notice the deception. A fly-caster is someone who not only knows the life cycle of the fish he wishes to catch, but also has a minimum amount of knowledge about the life cycle of the insects he is imitating. 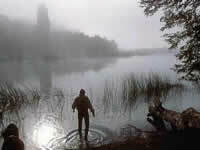 A good fly-fisherman ties his own flies, but everything is learnt with experience. There are schools and courses that teach anglers how to tie a fly and how to cast. It is basically made up of a rod, a reel, a line (which works both as a floating and a sinking line), a leader and the chosen fly. The rod must be relatively long, light and very flexible. The fly-fishing rods are made of three kinds of material: bamboo, which are the most priced, but also the most delicate; glass fiber and graphite. The function of the fly-fishing reel is to store the line. As the reel does not have a brake, this function is performed by the hand of the angler. The fish, once hooked, takes out all the line it wants during the fight, especially if it is large.